The fibre, after having been separated by the air, is exhausted by means of a simple vertical pressure.This passage is very important because with this action is avoided any damages and curling of the fiber allowing its reuse , or stocking , or directly on the press. 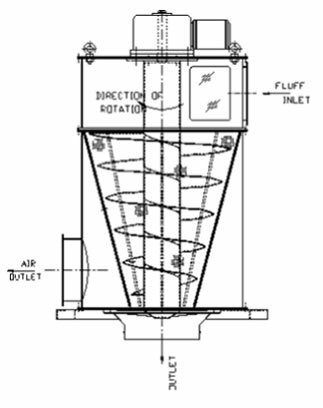 The airstream carrying the collected the materials enters at the top of the chamber through the tangential inlet, flows through the perforated steel cone and it is discharged through the outlet.The collected waste is accumulated on the iside of the perforated cone and these materials are continiously scraped off by the screw conveyor in a downward motion. The materials are pressed against the steel diaphragm at the bottom outlet opening. The materials are compacts by continious process and pushes the steel diaphragm open and the materials are discharged in to the bag or box. working as a seperator and compactor in one unit. 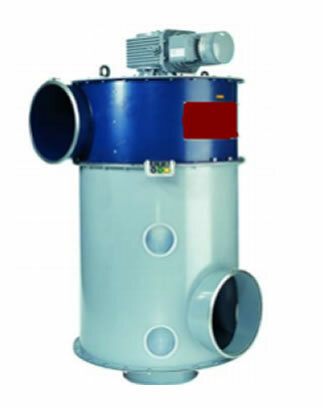 High material and air throughput capacity. Based on our Engineering strength and as an expansion and diversification of product we have started manufacture of OHTC and Bobbin Transport System, for the textile industry..
SF. 1/181 Pollachi Road, Malumachampatti Post, Coimbatore - 641 021, Tamil Nadu, INDIA.